Written by Aaron Allston, and the seventh book in the Fate of the Jedi series, Conviction delivers some major entertainment for readers. For this special review Synlah and I have partnered together to deliver a co-review covering the major elements of the story and our personal opinions of Allston’s work. So how was it? Click here to continue reading and find out for yourself. Quick! Name a constellation. Which one comes to mind? The Big Dipper? Leo? The Gemini twins? Orion? Perhaps Draco the Dragon or Perseus? Hercules the Hero? The teapot-shaped Sagittarius? Cassiopeia? Or maybe the beautiful Andromeda? Ask people to make a list of constellations they know or have at least heard of, and the name Boötes probably wouldn’t appear in the top 10. Or even the top 20. In fact, it probably wouldn’t appear on most people’s lists at all. It is without a doubt one of the most overlooked, most forgotten of the modern constellation. A lonely shepherd wandering the skies. Boötes (pronounced boh-OH-teez) is a prominent constellation in the late Spring and early Summer. Although it seems to have fallen into obscurity with the passage of time, it is one of the oldest constellations ever documented and has a variety of myths and legend associated with it. An Arab legend sees the circumpolar stars as a flock of sheep and Boötes as their shepherd. Other early civilizations in the Mediterranean and Middle East saw Boötes as a herdsman, cart driver, or plowman. Greek mythology had several references to the constellation. In some legends it represented the son of Zeus and a nymph, Callisto. Homer referred to Boötes in his epic story The Odyssey. And some of civilization’s earliest star-charts show Boötes as a running figure holding a spear. To modern star-gazers like us, Boötes is easily recognized as the shape of a kite with its bright Alpha star Arcturus anchoring the constellation at the point of the kite where the tail is attached. Arcturus is a red giant star only 36 light-years away from our own humble home. It is the fourth brightest star in our night sky. 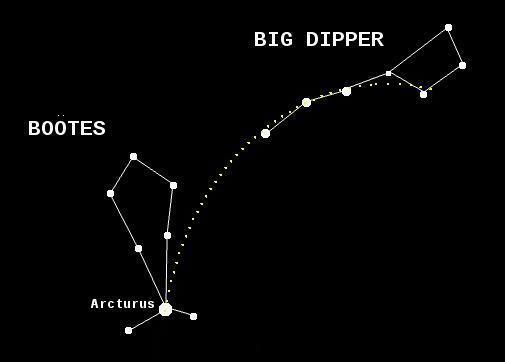 The easiest way to locate the constellation is to locate Arcturus using a favourite star-hopping phrase: Arc to Arcturus! How do you Arc to Arcturus? Locate the Big Dipper which is directly overhead in our June sky. Follow the handle’s arc shape past the last star, straight on through to the brightest star you can spot along the line of that imaginary arc, and you’ll have found Arcturus. From there, the rest of the constellation should be easy to assemble: the body of the kite shape comprised of the five stars above Arcturus, as well as the tail of the kite – one star on Arcturus’s either side. The constellation Boötes is the radiant point of a meteor shower this month. While not one of the showiest of meteor showers, the best viewing for this herd of shooting stars will be the early hours of the morning June 27th and 28th. For those who own a telescope, Saturn is a sight to behold this season as our view of the gaps between the planet’s rings becomes more prominent. For those without a telescope, Saturn – though a distant planet – is definitely visible to the naked eye. Through June it appears in the constellation Virgo, to the right of Virgo’s alpha star Spica (pronounced spEE-kah). To find Spica, use the star-hopping technique you used to Arc to Arcturus. Continue the arc down toward the south-west horizon and Speed on to Spica. Finally, the planetary summit which gathered on the low Eastern Horizon in May is coming to an end. Jupiter will break away from the group and start a dramatic ascent throughout June. If you are late to bed or an early riser, look for this spectacular point of light in the Eastern sky a few hours before sunrise. It will be unmistakable and breathtaking. No matter the season, the King of Planets never fails to put on a show! Have you ever wondered what’s involved in the making of a comic book? What does a colorist or inker do? In an effort to better understand how comic books are made, I took a close at the Star Wars Knight Errant comic series and conducted an interview with Star Wars writer John Jackson Miller. In the interview I was able to get a better idea of how the various creators work together in the modern age of comics, and more specifically I was able to get a really good look at the writer’s role in creating a comic book. Click here to read the interview. 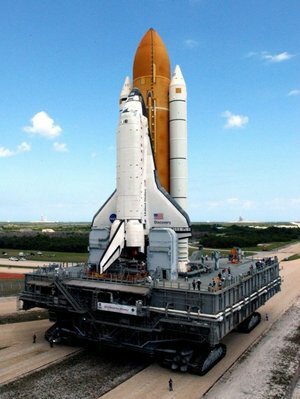 I found an excellent article by NPR this morning about how the Space Shuttle actually makes it to the launch pad using the worlds largest land vehicle, known as “The Crawler”. While Cmndr. Kelly and the crew of Endeavor (STS 134) prepare to land , the Crawler is slowly wheeling Atlantis (STS 135) to the ready position. So for this science Tuesday click the link and you can read about this behemoth vehicle and the people who make it work or you can even click the audio button NPR provides and listen to the story while you work. A vehicle that travels at 18,000 MPH gets wheeled out at less than 8 MPH. Message to School Officials: Lighten Up! Two students in Westfield, Mass staged a rehearsed and choreographed lightsaber duel in their high school cafeteria. Student witnesses laughed and gave them a standing ovation. The principle gave them a suspension and barred them from walking in their graduation ceremony next Friday. He cited the reasoning behind his actions. “They very easily could have hit another student they could have started something different…someone could have gotten hurt,” said Westfield High School Principal Raymond Broderick. Seriously? Somebody needs to grow a sense of humor here. Realistic toy guns I can understand, but plastic lightsabers? I hope someone clues the administration into the fact that lightsabers don’t actually exist in our universe, that is to say, the real universe. Kudoes to Club Jade for picking this up, and if you’d like to help the hapless duelers, you can do it on the facebook page supporting the students’ right to walk. On this Memorial Day Roqoo Depot salutes those who have given the last full measure for the freedoms we enjoy every day. A blast from the past, this French video on Youtube is, well, French. What can I say? Enjoy. Actress/Writer/Director Jennifer Landa show us how to speak Huttese. Enjoy! To learn more Huttese (and other Star Wars languages), visit The Complete Wermo’s Guide to the Galaxy. For those of you who haven’t read Sean Williams’ The Old Republic: Fatal Alliance yet, Del Rey has a nice little treat to help you make up your mind. Just follow the link for a 50 page preview of the book. With such a hefty glimpse of the 500 plus page novel, we’re pretty sure it’ll either sell you on the book or confirm your hesitations. Either way you’ll have peace of mind, so enjoy! The official site has revealed the back cover of Christie Golden’s upcoming Fate of the Jedi novel Ascension. Ascension will be the 8th novel in the nine book Fate of the Jediseries and is slated for release on August 9th. According to Star Wars Books Facebook page the back cover “features the most notorious bounty hunter in the galaxy!” so it’s safe to say it’s Boba Fett. As Luke and Ben Skywalker pursue the formidable dark-side being Abeloth, the Lost Tribe of the Sith is about to be sundered by an even greater power — which will thrust one Dark Lord into mortal conflict with his own flesh-and-blood.